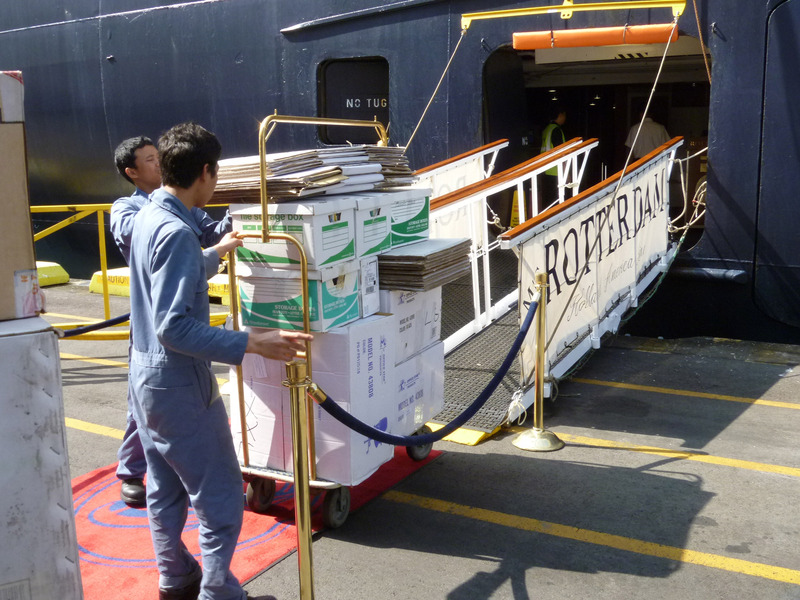 As the current supply missions on various HOLLAND AMERICA CRUISE SHIPS progress, the following information will be updated (in order) as they occur. Also, some pictures may be missing but are being added if they become available. Please keep checking to see any newer posts and updates. 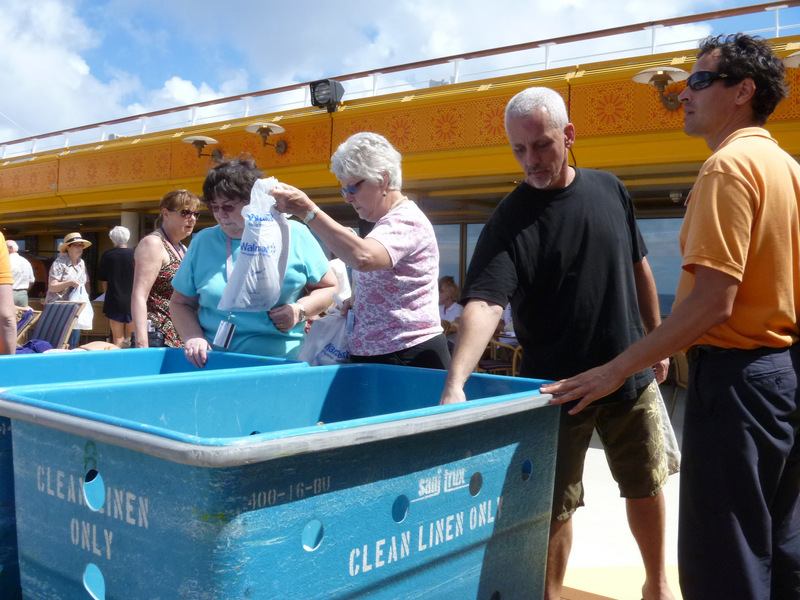 ATTENTION: IT IS HOPED THAT WHAT HAPPENED DURING THE JAN 2012 AND PREVIOUS CRUISES (see below) WILL HAPPEN AGAIN AND IN A GREATER CAPACITY! 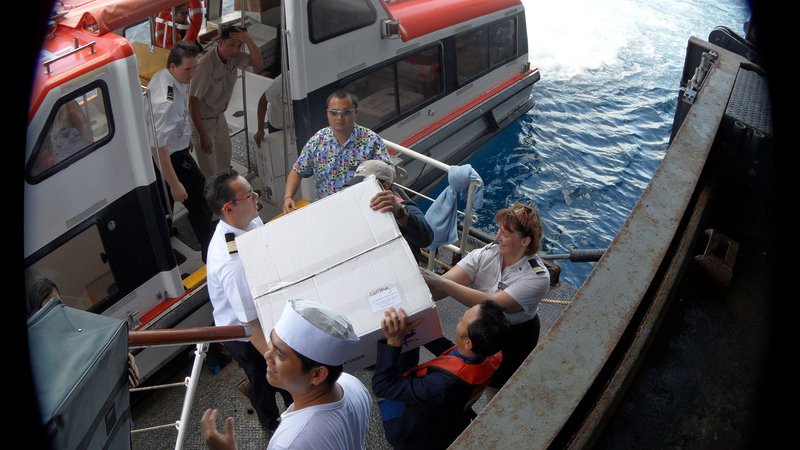 Jan 27, 2012 posting: Information about the Humanitarian effort to help Fanning Island and it’s people was presented before and during this sailing in many ways. 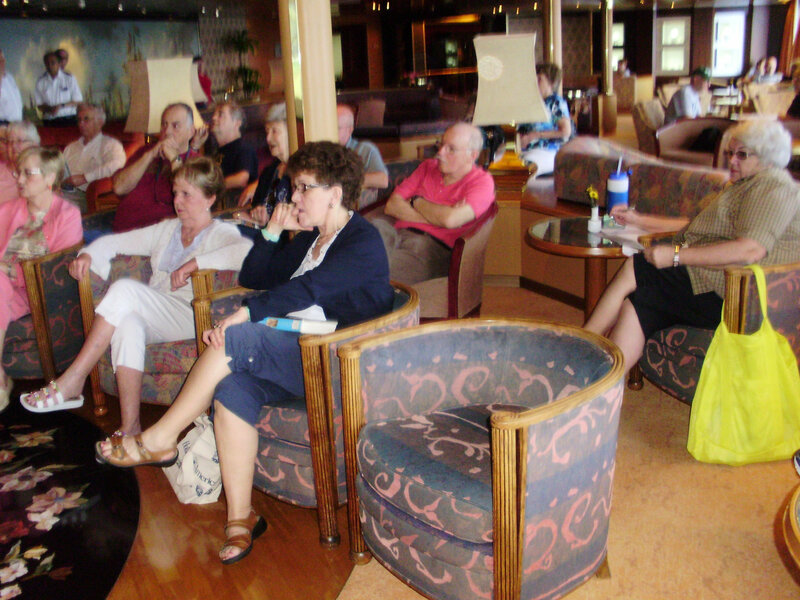 The passengers have said the PCM website was one of the main internet sites for getting information about the needs, what to buy and how to tour the island when visiting the island. 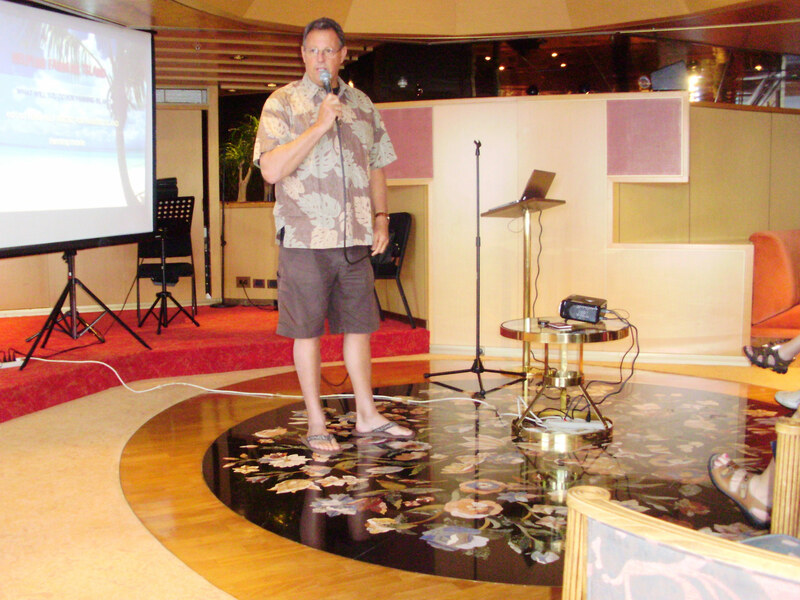 The information gathered before sailing and during the first 5 days before arriving Hawaii, was very well promoted by the ship, Lisa the travel consultant, and during a private (non solicitation) info presentation by Rich Smith to the Cruise Critic group and others traveling on the cruise. 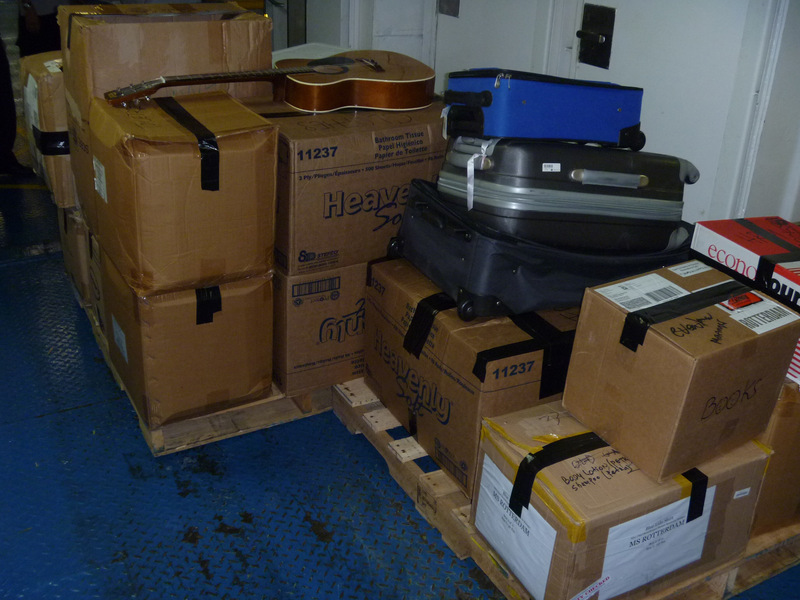 Like Ruth, seen here the day before sailing with her bags. 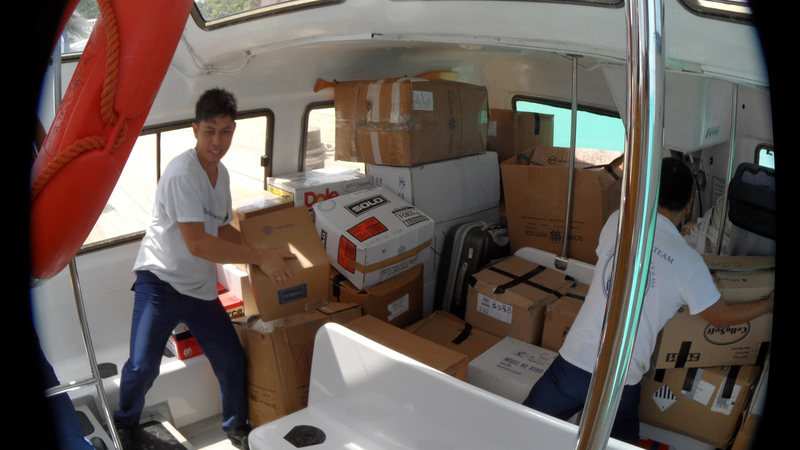 She arrived on Amtrac in early afternoon and was met at the station in order to help her with her donated supplies for Fanning. 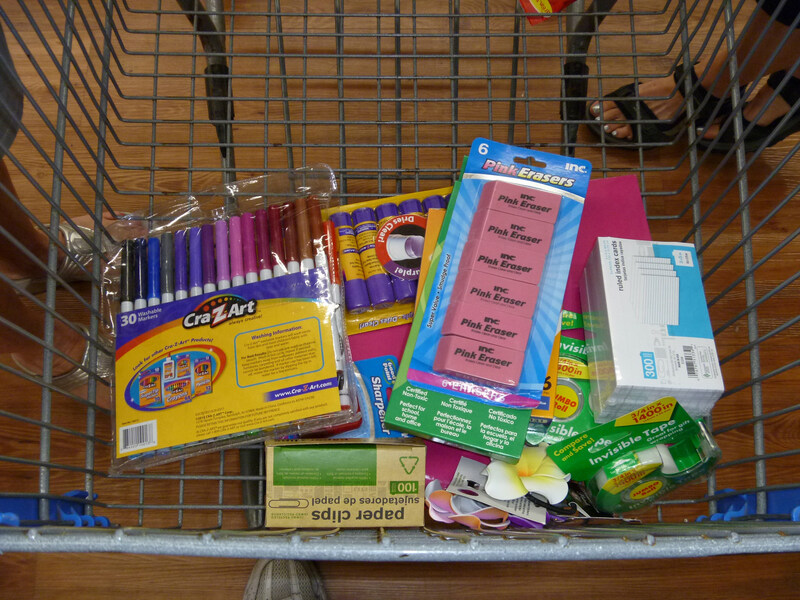 She had the satchal bag loaded with school supplies which included a couple reams of printing paper. So far this is the heaviest bag ever donated…… Would you believe she had the bag attached to her suitcase for traveling? She did! Way to go Ruth and what dedication and giving heart. 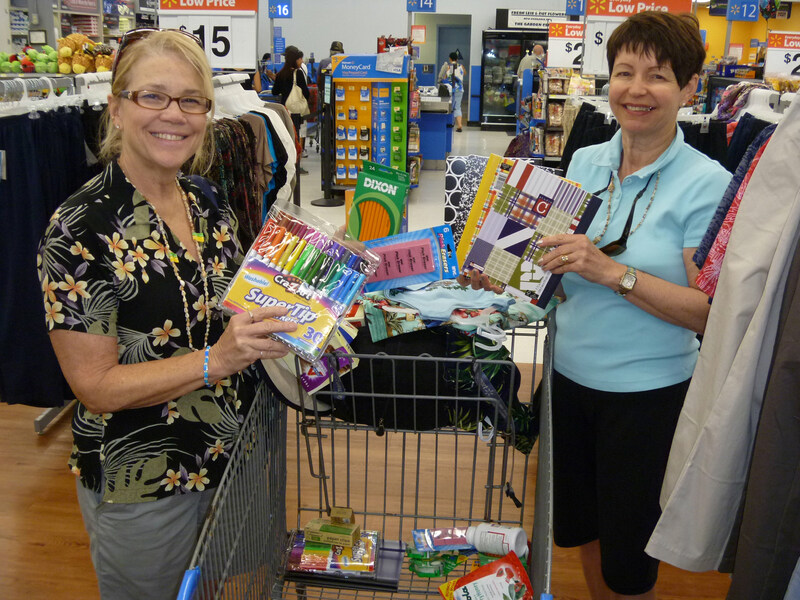 During the stays in San Diego, Honolulu, Maui and Hilo allot of supplies were purchased at the various Wal Mart, Costco, ABC, Longs and other department stores. 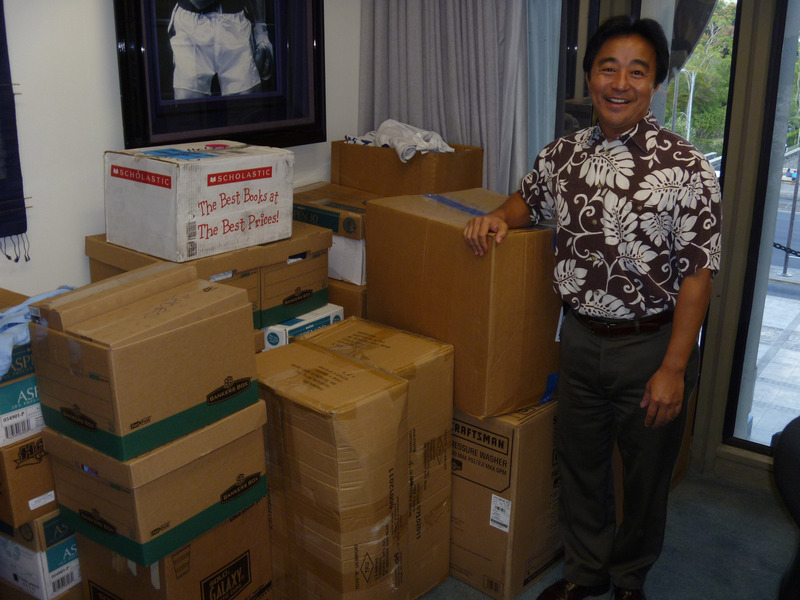 Honolulu Senator Glen Wakai, director of Reach Out Pacific, donated over 30 boxes which contained new T-shirts, stuffed animals books and toys. 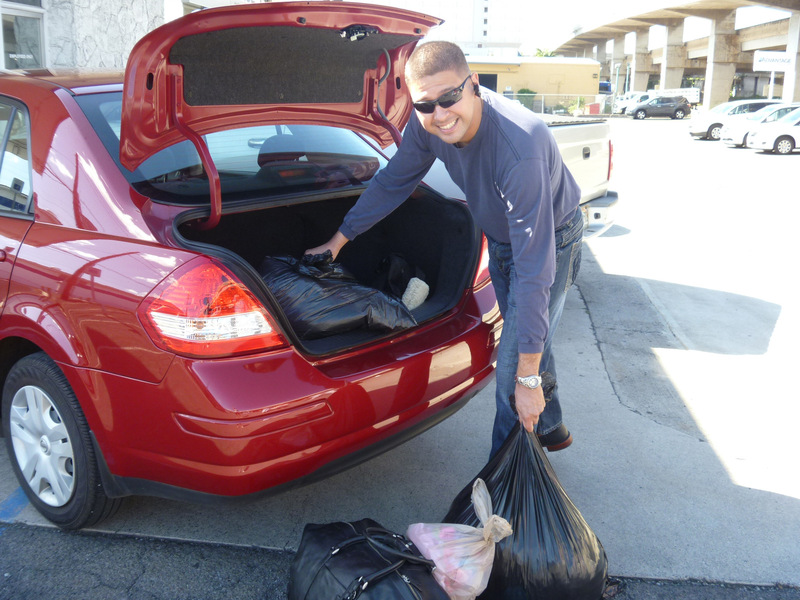 Honolulu’s Central Baptist Church Pastor Dan Douglass dropped off supplies and support from his church. 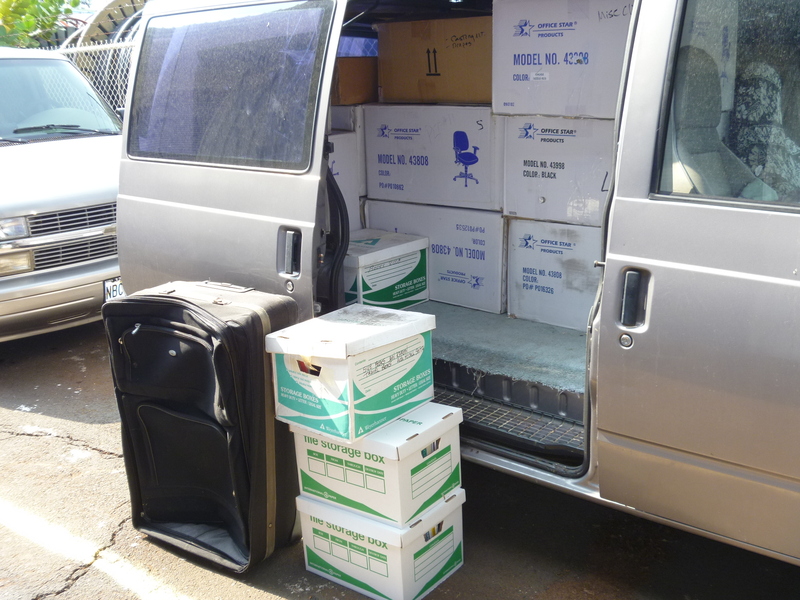 PCM volunteer Dennis Lomas drove across the big island of Hawaii with a full truckload of boxed supplies. 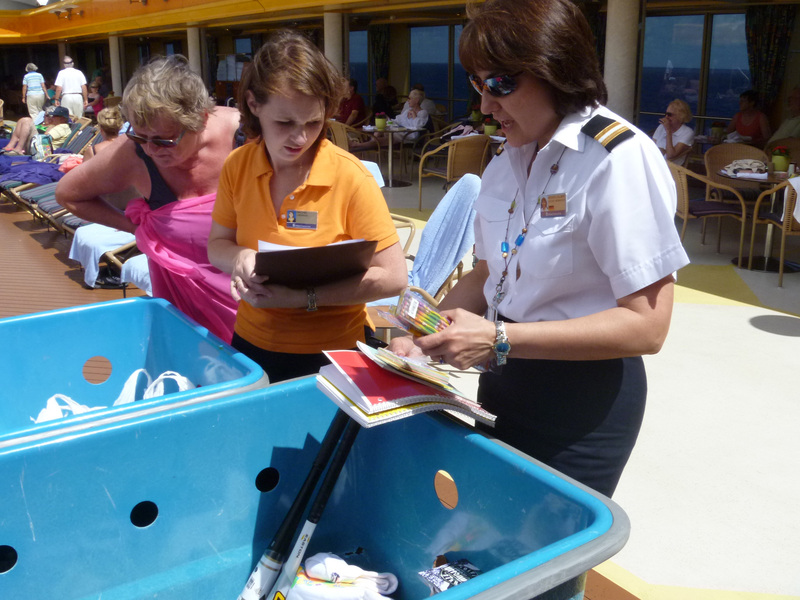 These were the Crock shoes and Health Center supplies donated and described in the pre cruise information. 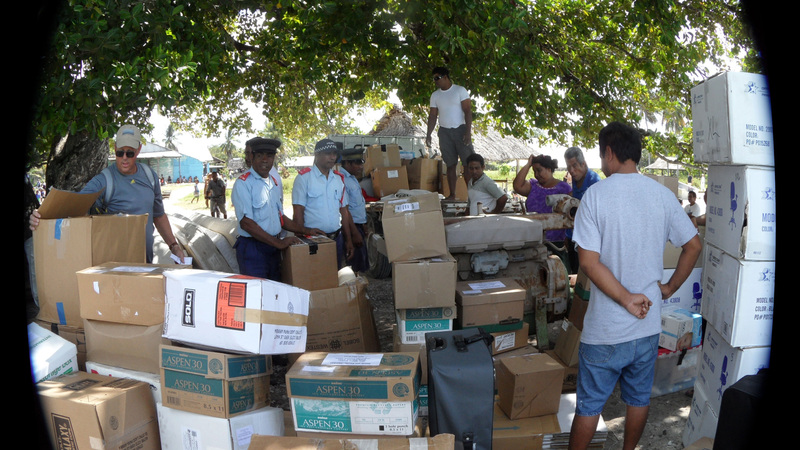 Some of the things were then given to PCM (for proper and secure storing). 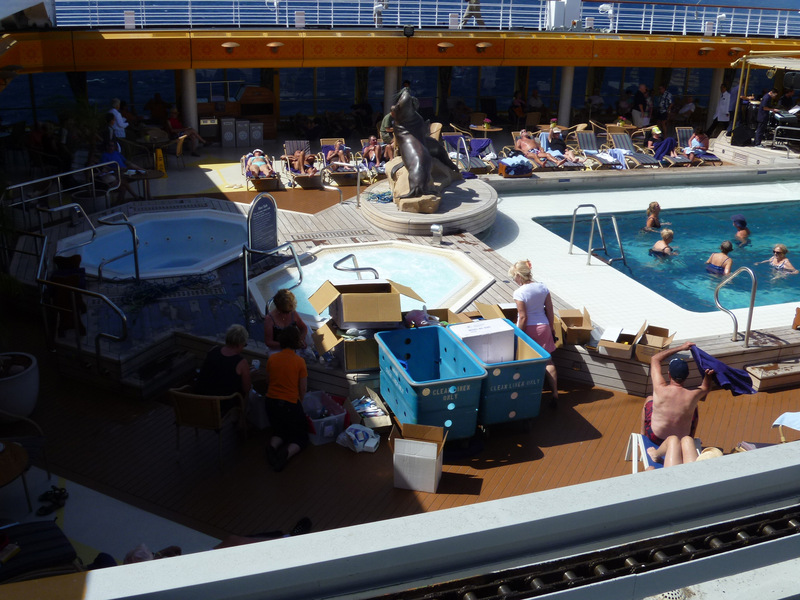 The ship also held a two hour collection event at the Lido Pool area the day before arriving Fanning. 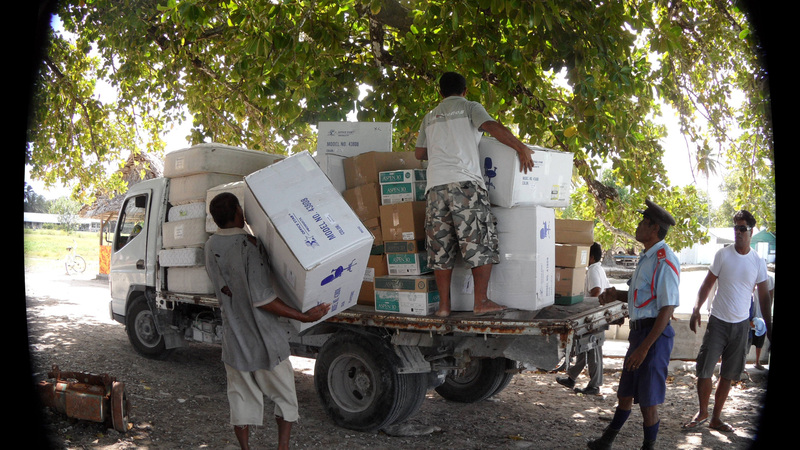 Two giant towel bins were used to collect donation items and they were then sorted for better itemizing and inventory. 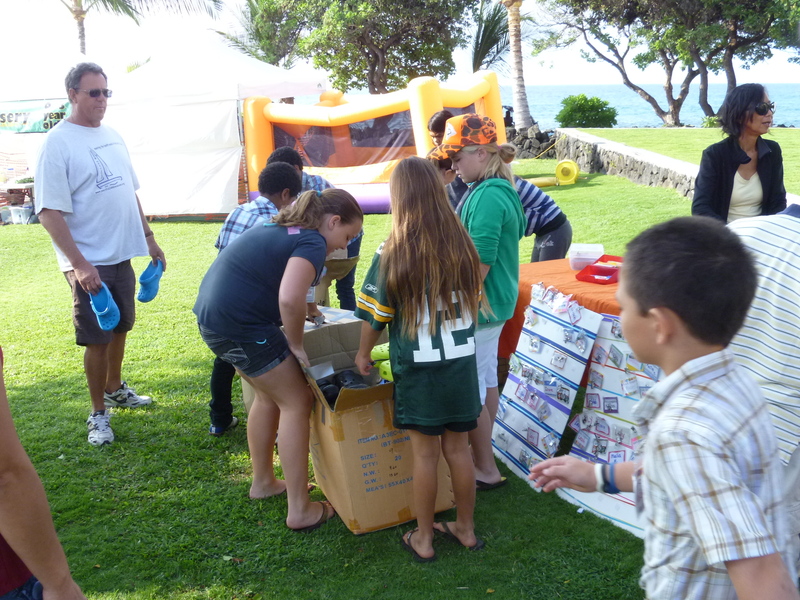 The event was such a success and many people who may not have donated any supplies felt compelled to help in some other way too. 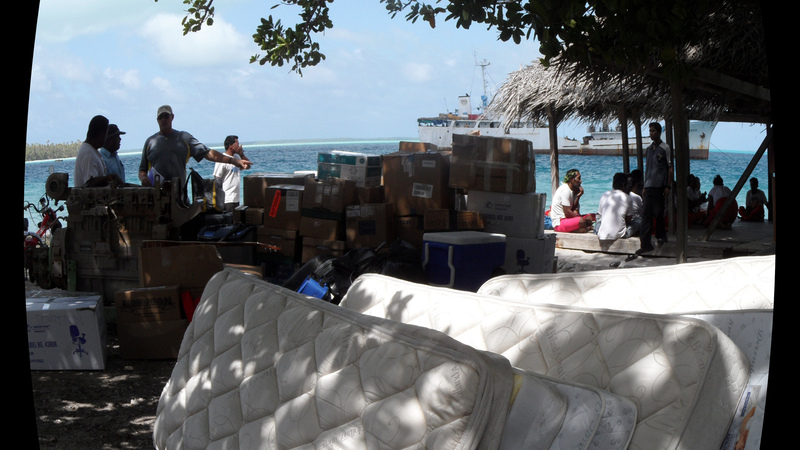 Once everything was collected by the ship it was then stored in a secure location along with the many items the staff had donated. 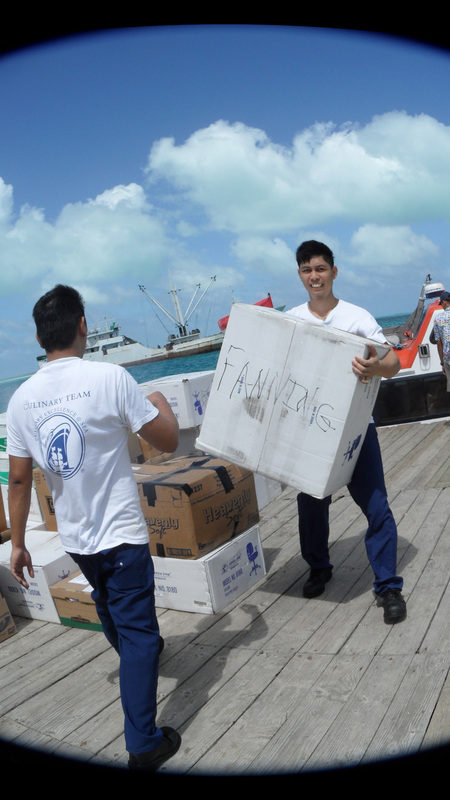 At Fanning Island, the supplies were delivered to the island with help of ship crew, locals and passengers. 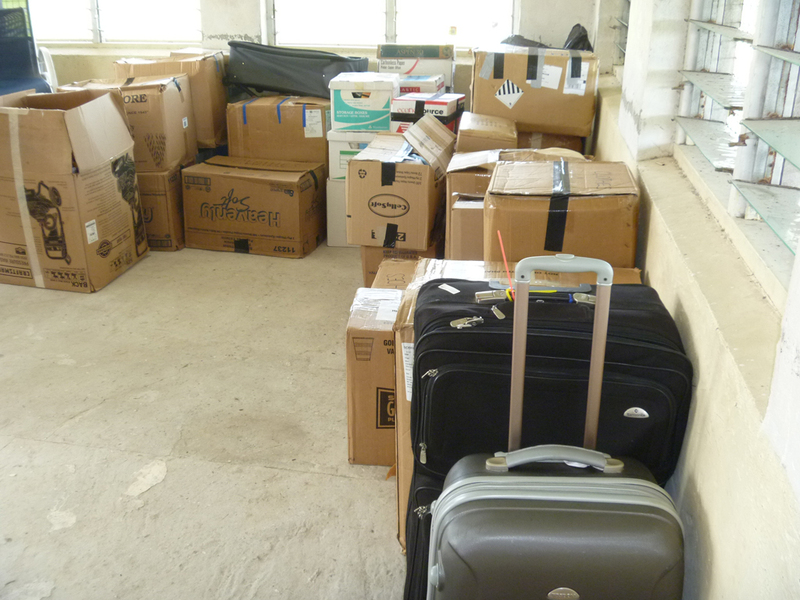 Dec. 29th: The following picture shows the supplies held in Kailua-Kona and ready for shipping to Fanning Island. 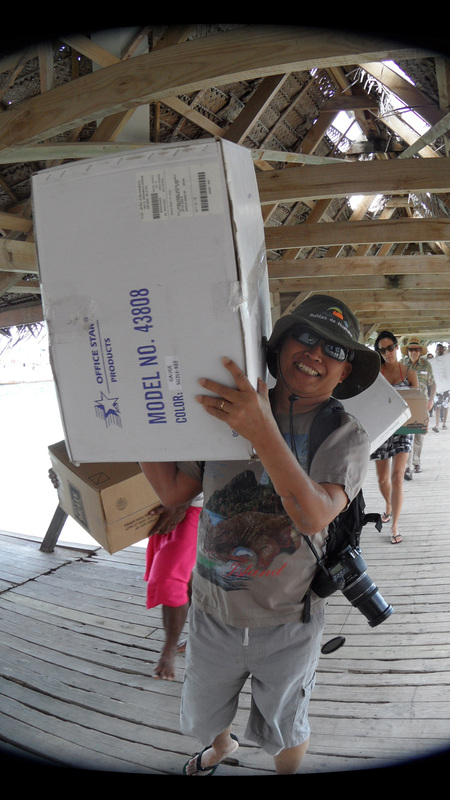 The boxes will be transported to Hilo Jan 12th by our driver volunteer Dennis Lomas. Thanks much again Dennis! 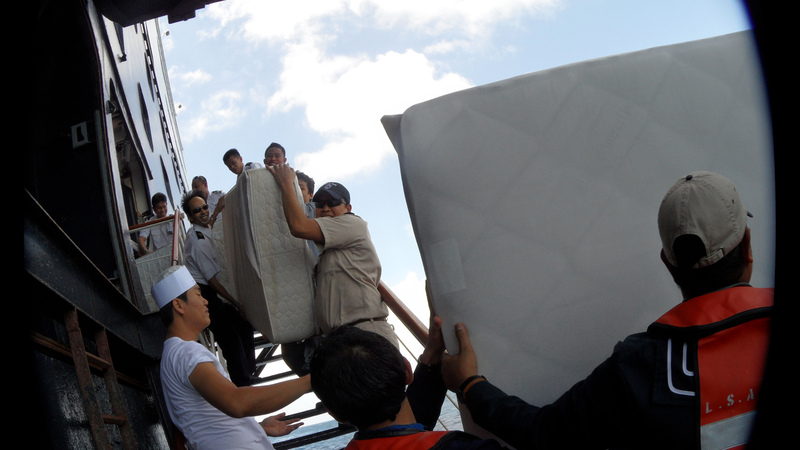 More supplies are also expected to be put on in San Diego by PCM and other passengers. 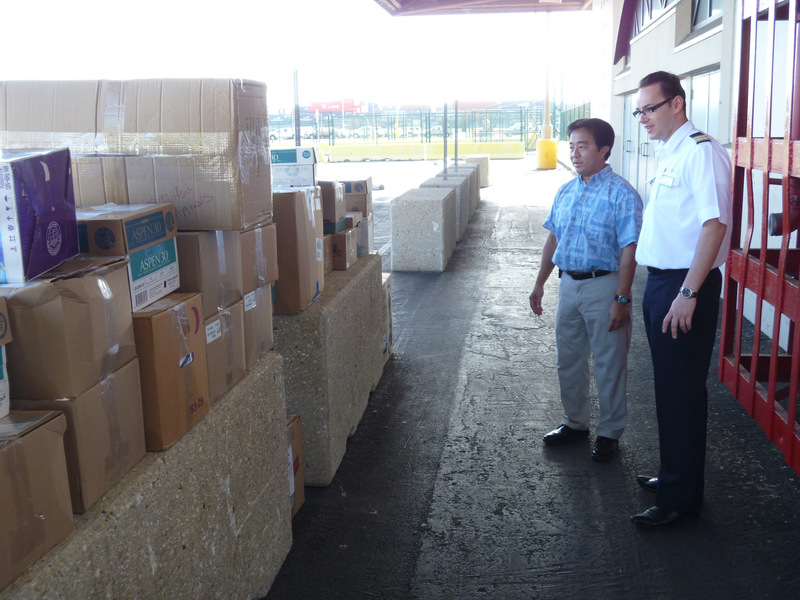 Upon arriving Honolulu, Senator Glen Wakai of Reach Out Pacific is planning on donating about 10 boxes of T-shirts. 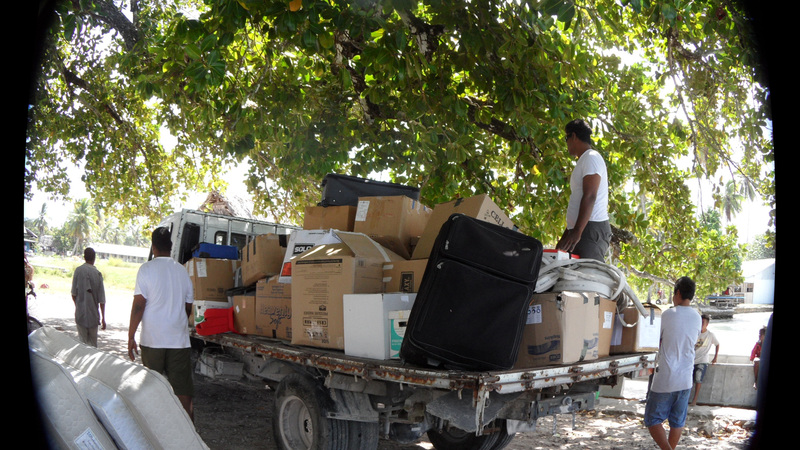 He is also looking into computers that are much requested from the Island. In communicating with the island secondary school principal, there is also a need to help them with photo printing and other computer processes. An assessment of their needs seem inevitable during our visit. 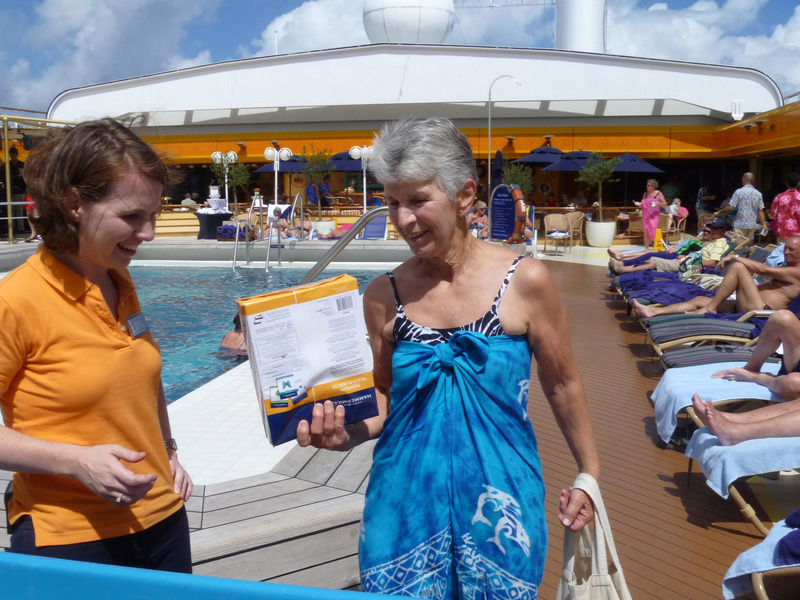 Also to be taken and delivered to a worthy party on Fanning is a water filter donated by Jim & Fae Lumsden who visited the island in September on the Westerdam. This filter could be a worthy item to the future of safe drinking water. Newsflash!!! Update from the island is that the instalation of the louvered windows and security wire for the new Health Center is nearing completion, FINALLY! 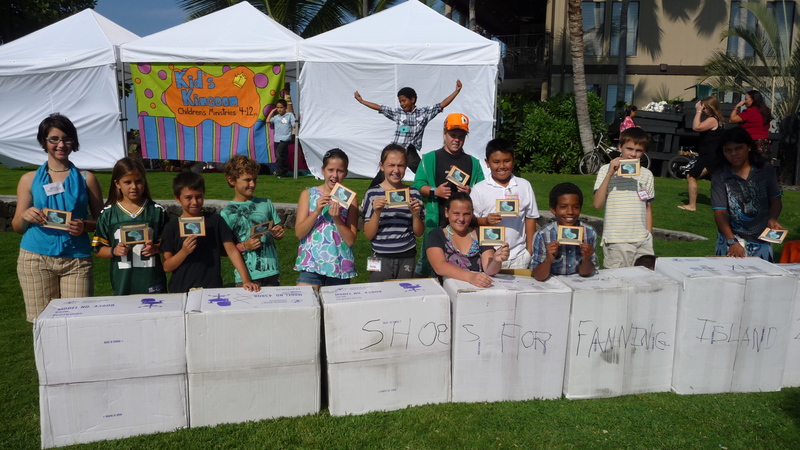 One group wanting to help is the Kona Hawaii youth from the Sunday School class at Living Stones Church. 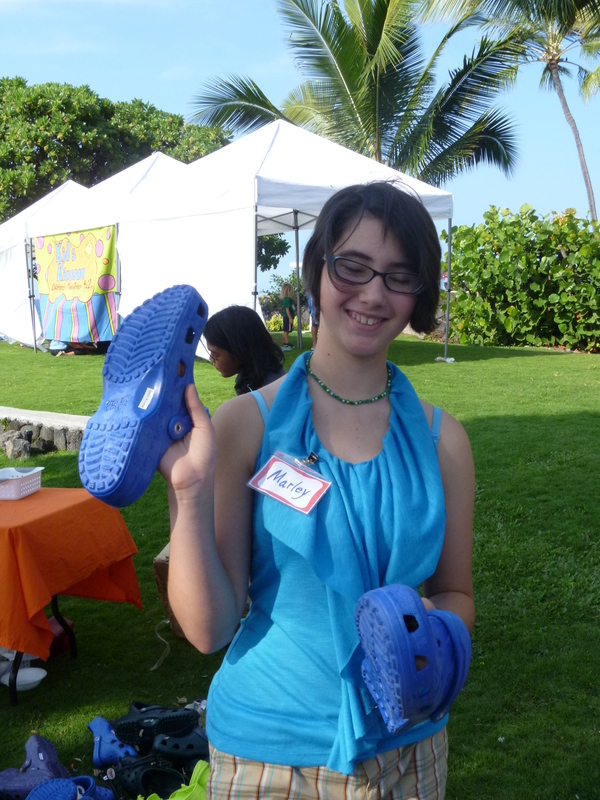 They eagerly became involved in sorting a large amount of Croc like footware that had been donated back in February by a Hawaii Volcano Rotary member. 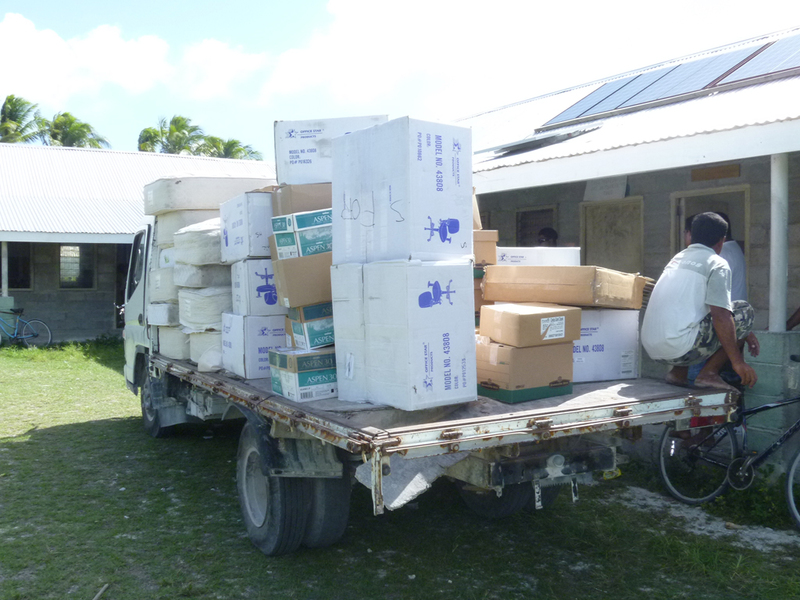 He donated them after a presentation was given to the Rotary group by Rich Smith/Pacific CARE Missions director. 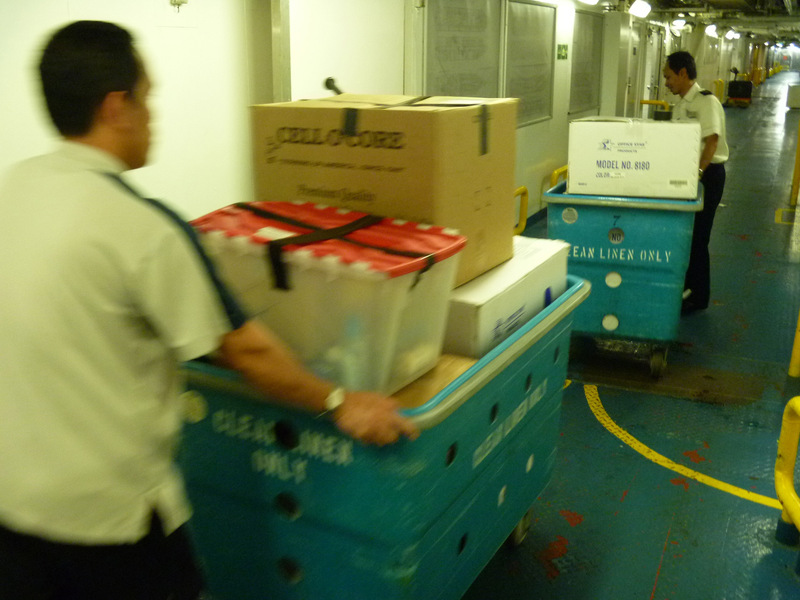 Unfortunately, a few of them had been damaged by rats during their storage but the majority were in great shape. 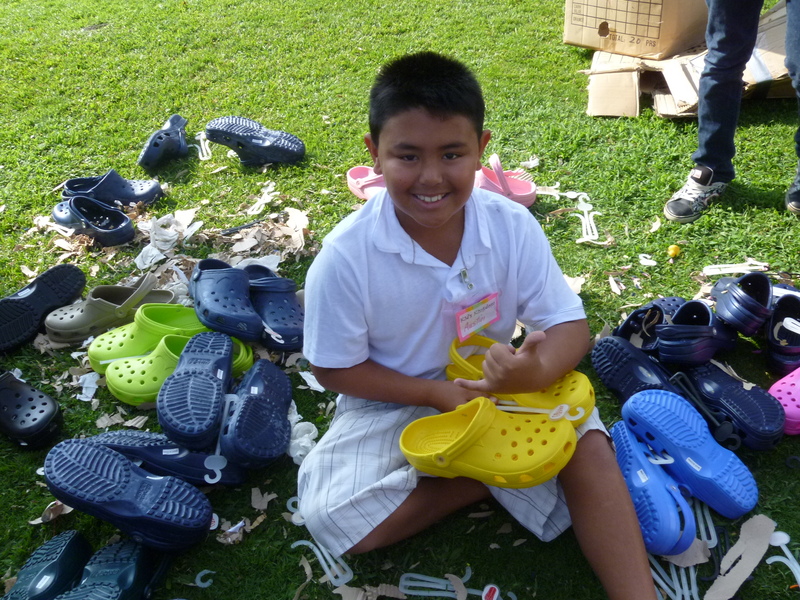 It was a great time sorting and preparing the shoes for shipping. 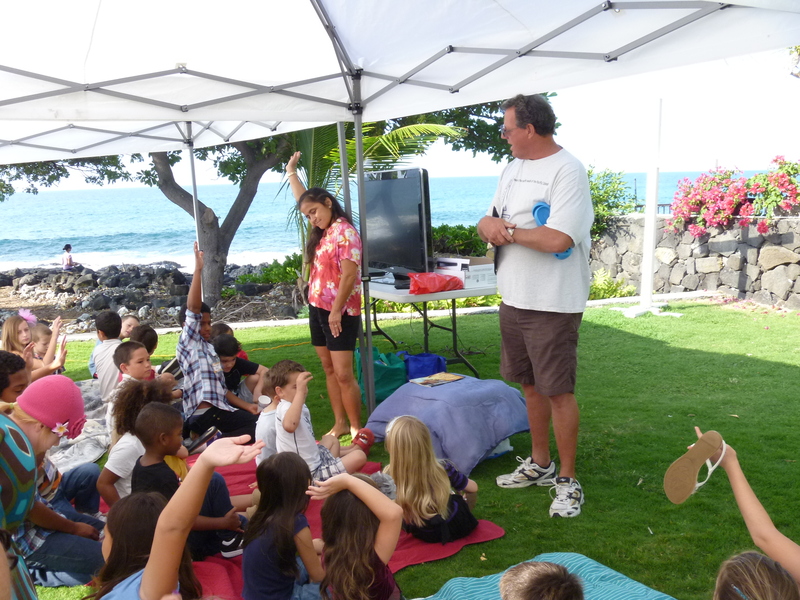 The many kids mentioned how fun the “workout was”. 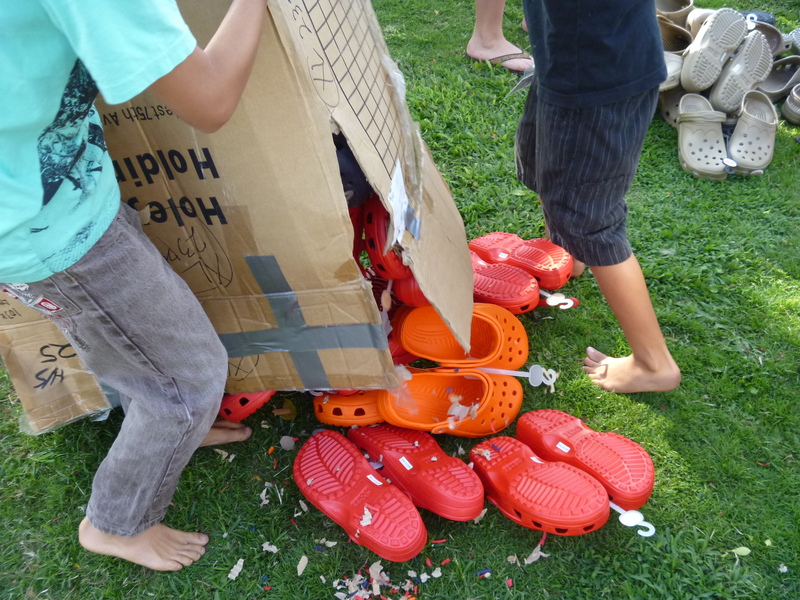 They truely did have to work fast with the many shoes, extra cleanup due to the debris inside the boxes, and time was clicking away before the main church service ended. We also found that there were mostly large to extra large sizes. 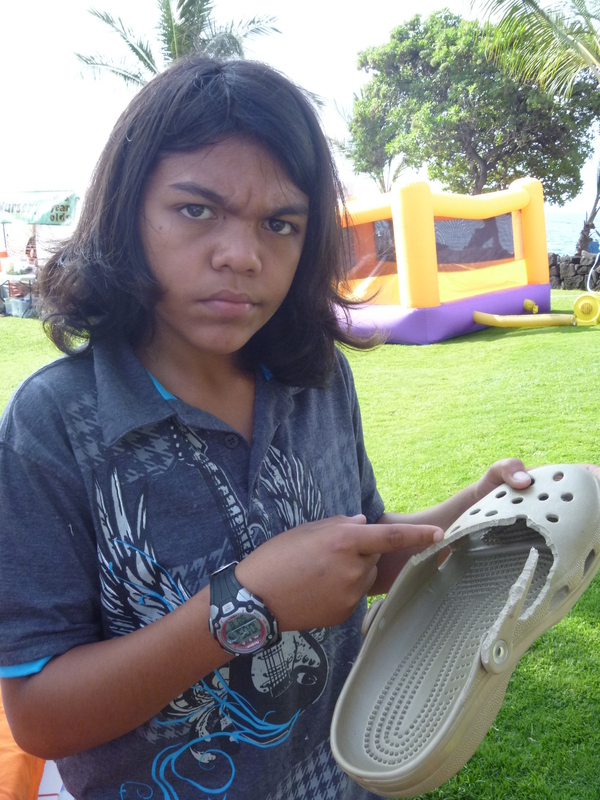 We can only hope there are big sized feet on the local people at Fanning island. 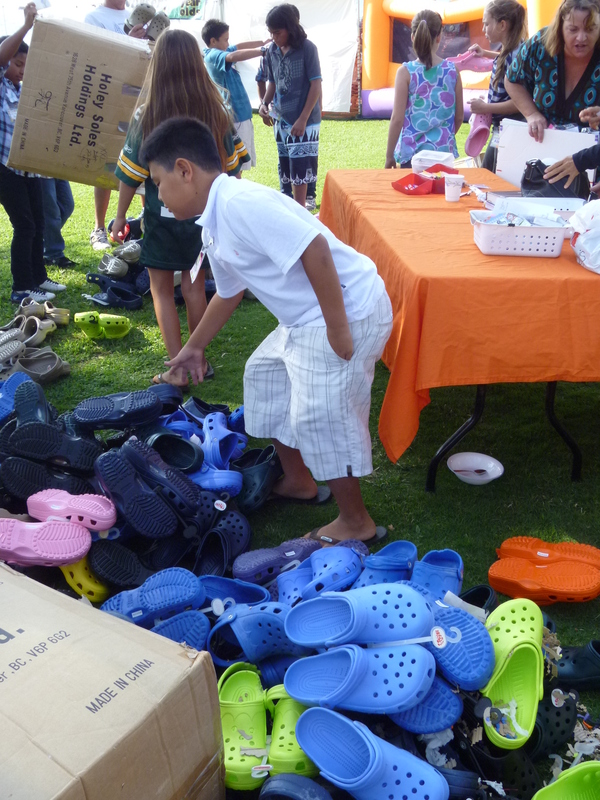 We are still seeking many other youth sized type of these shoes that we can then personally give to the school children on the island. 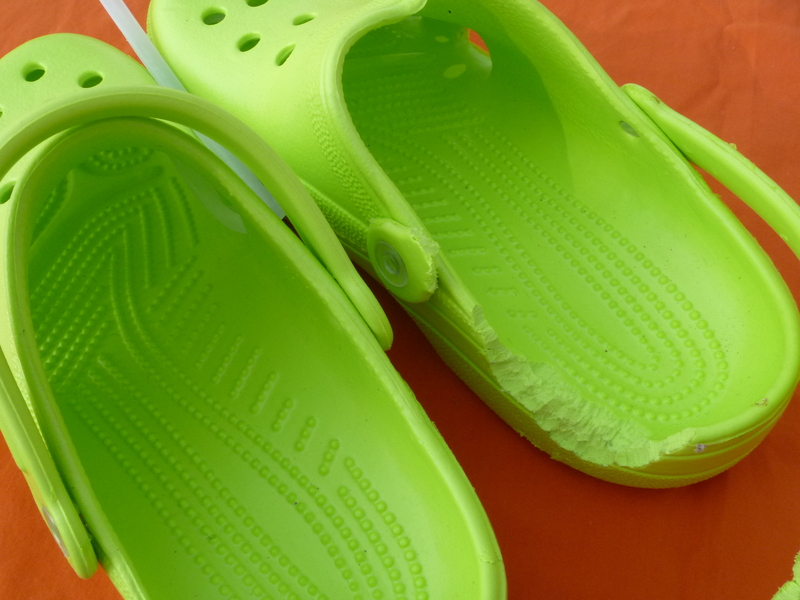 There is such an important need for footware to prevent parasites and infections from walking in the dirt and water and the unsanitary conditions that are present there. The mother of Marley came afterwards to say how influenced her daughter was to be a part of the activity and that she may also be doing some followup presentations in the future to her school after getting more information. 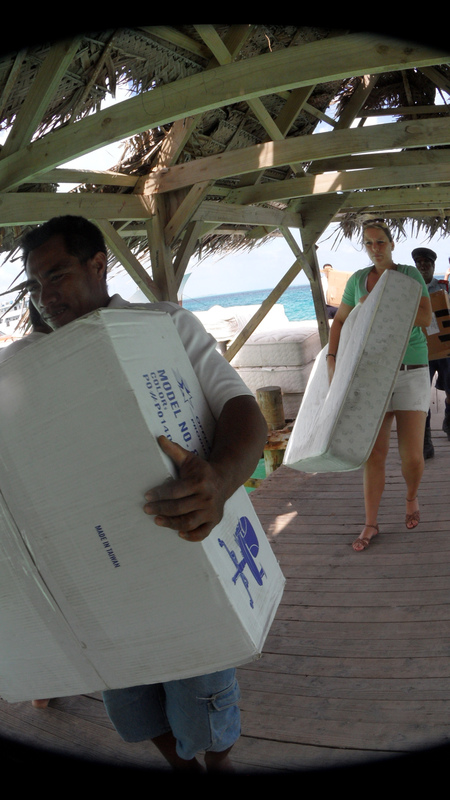 A much appreciated thank you to this group of kids who wanted to help meet the needs of the people on Fanning Island.